It is a very rare thing, what I saw tonight. The world premiere of a new oratorio by one of classical music’s most valuable, surprising and incisive composers, performed by the mighty New York Philharmonic under its exceptional new conductor, featuring two (!) choirs, and directed by a towering member of the theater world. Watching Julia Wolfe’s Fire in my mouth tonight felt to me like being part of history. It is an astonishing and important piece. Fire in my mouth tells the story of the Triangle Shirtwaist Factory fire, through the words of the girls and women who worked at the factory, and through music of extraordinary power and invention. The piece progresses through four movements: Immigration, which uses Mollie Wexler’s oral history to tell how five girls crossed the ocean “without passports or anything” to come to America; Factory, a devastating sonic collage in which the strings, scraping the bridges of their instruments with the frogs of the bows, emulate the sound of a thousand sewing machines, while the choir sings a Yiddish folk song and an Italian tarantella as the rest of the orchestra booms and belches around them; Protest, a propulsive and mechanical paean to the women’s ambition for equality, their determination to “feel like an American”; and Fire, the hypnotic and terrifying conclusion, climaxing in a canon made up of the names of the fire’s victims. It is of course a highly emotional piece, but there is nothing exploitative in it, nor anything maudlin. Wolfe’s greatest accomplishment here is her mastery of gesture – the ideas are always surprising but always clear, and without exception she carries every idea to its natural conclusion and then lets it go. A representative example: each member of the choir carries a set of industrial scissors, and at certain points, the choir opens and closes their scissors in fearsome unison. It’s a potentially gimmicky idea, but in Wolfe’s hands, it’s a structural element, and as vital a part of the sonic tapestry as Mime’s anvil. Throughout the piece, she wields her compositional command with a majestic confidence: Nothing feels extraneous, nothing feels overdone. Wolfe’s harmonic language has a lot in common with the Minimalists of the generation before her, but there’s also a theatrical urgency that feels to me very much like rock – ferocious and undergirded by relentless groove. It’s an hour of music, and none of it feels wasted or indulgent. But for all the confidence and brilliance of the score (and Anne Kauffman’s deft staging, featuring Jeff Sugg’s exquisite projections), the thing that may have affected me most was what happened after the piece had finished. There, mounting the podium to take her well-deserved bow, with the eighty-some musicians of the New York Philharmonic on stage surrounded by the thirty-plus women of The Crossing and more than a hundred girls of the Young People’s Chorus of New York City, was a woman – an accomplished, acknowledged master of her craft – who used every bit of her consummate skill to tell the story of the sacrifices made by other women more than a century ago; and I was so grateful that the teenage girls in that choir could look up and see that, right there in Geffen Hall, tonight in 2019. 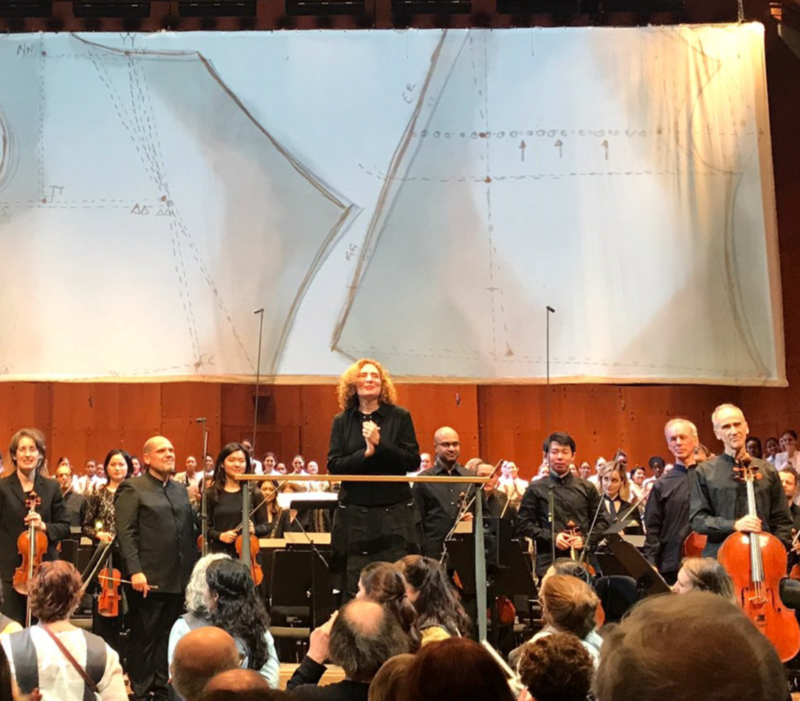 It shouldn’t be unusual to see a female composer taking a bow at the New York Philharmonic but of course it is; and now those girls have seen it, and they know – like everyone else in that theater tonight knows – that it is absolutely necessary. The New York Philharmonic performs “Fire in my mouth” two more times – Friday 1/25 and Saturday 1/26 – and tickets are available. Photo by Jose Simbulan, who really shouldn't be taking pictures at these concerts but I wasn't about to stop him. Thank you for this wonderful review Jason. I can’t wait to experience it. Thank you for your wonderful review. I was in the audience on Thursday night and was overwhelmed by how music itself, the orchestra and singers melded with the video to draw us into the moment. The boat journey, alone, with the singers countering each other, made you feel the ocean waves of the ocean and put (at least) me on that boat. At the end, it almost felt like an insult to applaud such a stunning work but of course I did. As a note: I’m a jaded retired theatre gal. I so agree … the musical event that I was most reminded of during the performance was the last King Crimson tour, which I saw in Port Chester. Wolfe’s oratorio is by far the best musical performance I have ever seen in 65 years.